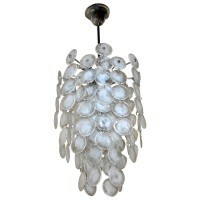 An Italian Mazzega style five-light cascading chandelier with fused clear and white small disk (2.25″ diameter) chandelier or hall / entry pendant light. Chrome-plated metal frame uses four candelabra size bulbs plus 1 – 60 watt regular “A” base bulb, newly wired. Measures: Height of fixture 19″ tall, overall height including center rod and ceiling cap 31″. Height can be adjusted higher or lower upon request.